Port greening is rapidly increasing globally. Adding to a limited type of research across port management disciplines interested in the context and the factors that have shaped green port organizational performance, this thesis research combines resource-based view (RBV) and organizational institutionalism, applying it to an organization type which is slightly different from ‘normal’ firms, namely the Port Authority (PA). The study approaches the European green port concept in terms of EMS standards implementation -at both the field and the organizational level- from 1993 to 2010. Initially, it embraces the core neo-institutional perspective and assesses the occurrence of the European green port organizational field by observing the European ports’ collective response to greening, but it also identifies the mechanisms involved. Its appraisal of port organizations as dynamic entities which can respond to external pressures in a variety of ways reflects its predilection to consider Oliver’s (1991) suggestions that different variables represent environmental strategic response. The last part of the analysis advocates that the EMS standard diffusion impact is contingent to port organizational resources and offers a more synthetic perspective of what matters to the adoption of environmental practices. An inquiry based on RBV is employed for a supplementary analysis which explores how individual port internal resources and capabilities coalesce to external field dynamics in developing and shaping the organizations’ strategic response. 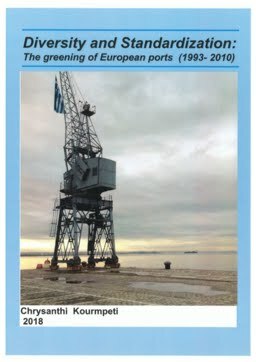 The different ways in which ports perceived and chose to strategically implement their greening process by implementing EMS standards is comparatively explored by the four (4) selected port case studies, which make it possible to understand how and why European ports have been altered towards greening. The study contributes to the growing empirical literature on port sustainability and more particularly on the emerging field of port EMS standards implementation threefold, by explicitly introducing: the mechanisms that provoked EMS standards implementation; the institutional factors that shaped individual green port strategic response; and the role of distinct organizational capabilities in building up the individual 'green port'.